ScanMyPhotos.com Blog: Can I Have My Photos From Overseas Scanned? Sure. 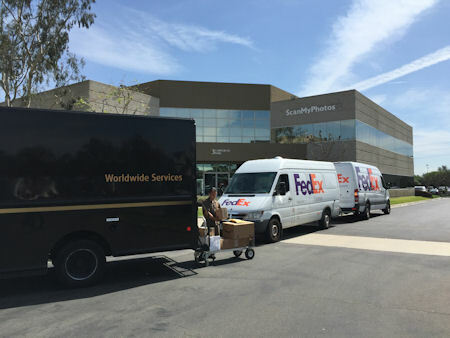 ScanMyPhotos.com is international, thanks to our arrangement with FedEx Priority International. But, just how fast are we? Here is a perfect example. A large box of pictures (8 lbs) arrived at our Irvine headquarters on Friday, Dec 28th. As with the millions of other photos that we scan, this order was completed and sent back the same day. What drives home the value of our super-fast photo scanning, and our technological infrastructure is that this particular order needed to be returned to Australia. That's right, Australia. We sent it back on Friday and our FedEx tracking updates advised our shipping facility that the order was received before 10:00 a.m. tomorrow, down under on Dec 31. It is still Sunday in California, but we are around 24/7 because every order is just as special.